Come and relax at our beautiful home in Southern Shores, 3 miles south of Duck. Havana Daydreaming has beautiful Ocean views. Come and bike on our bike paths for miles. 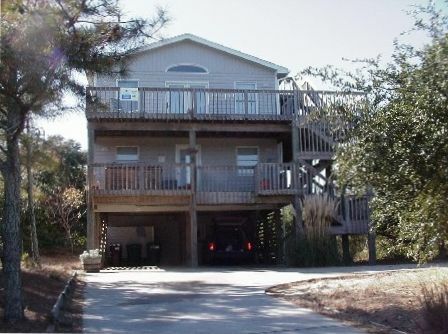 Beach access directly in front of our home, 400 yards with an easy walk or park at the beach. Private sound beach available for rough days on the ocean with jungle gym and porter potty. Catch your fish and grill with our gas grilling station on a covered deck surrounded by chairs and table with outdoor lighting. Many amenities, easy access to restaurants, golfing, shopping and more. Partial weeks available off season. Saturday to Saturday rental. No processing fees, work directly with the owner. Early check in available, Bikes available and linens available . Please inquire. Paul and I built this home with a lot of love and care. You will notice many items like seashell lamps where we walked with our son who is now in college and our parents who 3 of the 4 are deceased, paintings etc that have a lot memories. Our home offers somewhere to relax: on the widows nest, hot tub or big couch. We love to tandem and their are lots of trails, etc. We love the Outer Banks and hope you will too. Havana Daydreamin is in a wonderful area, quiet yet close enough to shopping, restaurants and entertainment. Beautiful beaches, nice bike trails. Our home is snuggled back on the lot allowing privacy. We built this home and have shared many memories with our son, his friends, our exchange students, family and friends. Many friends have been made with our renters. Havana Daydreamin is a hidden gem: well priced, clean and spacious. It is snuggled up the hill on Duck Rd offering privacy. It is a short distance to the beach walking and parking passes are offered for Hillcrest parking with porta potty and lifeguard as well as the sound beach. Our home is located at the beach access. An easy 5 minute walk. Parking passes are available for those who do not care to walk. Soundside beach available with a playground within a 5 minute drive perfect for rough ocean days. Fully equipped to prepare a king's meal. Bar counter to seat your friends with a beverage while you prepare your meal. Stereo and TV at your becken call. Outdoor picnic table on a covered deck outside the kitchen door. 50 in flat screen with surround sound upstairs with large sectional couch for comfort. stereo in upstairs living area, downstairs in game room, speakers outside at hot tub and widow's walk. Can have different music at each location. fooz ball, flat screen, lots of games and videos. Privacy for the kids allowing mom and dad time upstairs. Classics, children's films and newly featured films Books are provided as well. Board games available. 2 beach bikes available for $40 for both for the week7. Decks are a major item here at Havana surrounding our home. Decks for cooking, sunning, sitting on our swing, enjoying the hot tub, picnicing, and enjoying the sunrises and sunsets on our widow's walk 32 feet up. Music available on the decks. We can rent and have delivered or direct who to contact. 5 Person hot tub with outdoor speakers located outside the master suite on a covered deck, easily accessible by all decks. Offers privacy. We had a great weekend here! Becky was so kind, and flexible when the weekend we were supposed to go didn't work out. Definitely would recommend. Thank you for your review. We are glad we were able to work with you on the date change. Hope to have you visit us again. Great beach house with many amenities. We spent a week here and had just the best time. The living room is comfortable and airy with plenty of room to move around. Our grown kids joined us and everyone had their own bedroom and bathroom. The beach is a short walk and we spent most of our time either on the beach or enjoying the porches. Our family vacation included my husband and I, two sets of grandparents, and our 7 year old son. We greatly enjoyed staying in this house. The location was great, with an easy walk/bike ride to the beach and ample parking at the beach and the sound. The house was well stocked with books, games, beach toys and kitchen equipment. We loved the hot tub on rainy days, and the viewing deck was great for watching the sunset. Upon arrival, we encountered a couple bumps due to issues with housekeeping not laundering linens, and the previous tenants not taking out trash on the designated days. However, it did not impact our trip and the home owner was easy to contact and very accommodating. We would definitely book this house again for future family vacations! We are delighted you enjoyed our home. We love the widow's walk too as well as the biking/walking trail that takes you into Duck. We hope you tried Duck's Donuts. We are sorry for the little bumps. There was a communication break with our cleaning service concerning the linens. We also spoke to them concerning cleaning. Paul and I try to go down every 3 weeks to clean and check things over. Thank you for bringing your thoughts to our attention. We can not address them if we do not know. Come again and enjoy the remaining of your summer. This is one of the best maintained cottages in Southern Shores- very neat and clean. Great value and great location. Very convenient to drive to grocery stores and shopping and to walk to the beach. Owners were very nice and they made the rental process easy. Thank you for your review. It was a pleasure having you. We came to the OBX for a family wedding on the Kitty Hawk Pier (5 min away). The house was perfect- exactly as it was shown. The house if very spacious and has everything you need. We also rented the sheets and towels. The owner was prompt and answered all of our questions. Short distance to the ocean and the hot tub was a nice feature!! House is close to all activities and only 5 min from the town of Duck. We would highly recommend this rental! Thank you for your review. It was a pleasure working with you. We enjoyed having you as our guests. Please come again. Prices average $200.00 nightly but are priced due to season. Weekly rates apply between Memorial and Labor day. Please inquire for the weekly rate as they differ during the season. Linens, early check, and pets are available for additional fee.